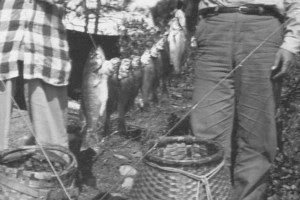 Fishing for rainbow trout on Cedar Pond in Central Maine, north of Milo between Brownville Junction and Millinocket, was a challenge back in 1960. Today you can drive right up to the pond without touching a tote road, pull off into a gravel parking spot, and be fishing within minutes from a canoe. Fishing Cedar Pond was not that easy when I was a teenager Growin’ Up in Maine 40 years ago. Before mid-1960 the trip was one hour on a paved road, half an hour on a dirt road, a mile on a tote road, and then an hour hike through dense woods over rough terrain including hills, bogs, muck and mire, more hills, and mosquitoes the size of a chickadee. Boats or canoes were not an option. Approaching our destination, the first person to arrive atop the last hill could usually see the pond in the distance through the trees, and yelled “I see dah pond (Cedar Pond)”. It was a corny yet mandatory exclamation passed down through the generations. Upon arrival it was sometimes impossible to catch trout from shore, so cedar log rafts were necessary. These were not ordinary cedar rafts like the new ones we built each year Down Back near the old swimming hole to replace the ones swept away downriver in Spring floods. Pond rafts don’t float away, so the cedar log rafts on Cedar Pond spanned generations and survived the ravages of Maine year to year. I floated on the same rafts used by my parents and grandparents. Now the real adventure began. The first priority was circling the pond in search of a log raft. Next you needed a 3-4 pound rock to place in the woven backpack like the fishing basket shown in the photograph above, and a long wooden pole for navigation. Finally, standard gear was a light fishing rod and a bait can with earth worms strapped to your belt. This rainbow trout technique created an illusion that was certain to shock a first timer watching from shore. Picture a person standing on the water 100 yards in the middle of the pond, because that’s what it looked like. These old time rafts were waterlogged and much of the buoyancy was gone, so if you got a good ‘un it would float enough to keep from sinking, but all the logs stayed about 6 inches underwater. The rock in the backpack was to keep the basket and your fish from floating away. Navigating was a bit sluggish like pushing a raft through mud, but it worked. When you caught a trout you’d flip it into the basket before unhooking it, then continue until you caught your limit or drowned the last of your worms. As you can imagine, this was not a lazy man’s way to go fishing, so competition was scarce unlike pier fishing which is often elbow to elbow. Our typical group of 4 rarely saw more than 1 or 2 strangers on Cedar Pond on any given fishing trip. The easy access to Cedar Pond years later ruined the adventure, peace and quiet, and unspoiled beauty. I never returned under those modern conditions. I could just imagine people bait casting without getting out of the car, or quick hops from pond to pond like a raiding party. The fish suffered, too, as the size and number of the rainbow trout dwindled rapidly. Maine State stocks ponds nowadays, so perhaps the trout rebounded, but Cedar Pond will never be the same. Farm trout are not as wiley as native rainbow trout.